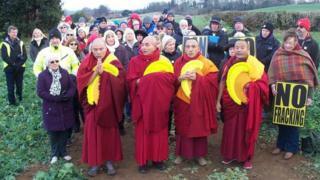 The Gyuto Monks, who live in exile in India alongside the Dalai Lama, were invited to Woodsetts to support anti-fracking campaigners. Energy firm Ineos has submitted plans to drill an exploration well for shale gas on land south of Dinnington Road. Campaigners said the "land puja ceremony" was intended to restore peace and harmony to the land and village. Matthew Wilkinson, from Woodsetts Against Fracking, said the monks visit was aimed at raising global awareness of their campaign. "We are tremendously worried and concerned by these plans. "The site is 500 metres away from a primary school and we do not want our children's health being put at risk." He added: "This land blessing is much welcomed. We want to preserve this beautiful countryside for the village and future generations." Earlier this year, Ineos was granted temporary injunctions to prevent disruption by anti-fracking protesters at their sites across the country, including the one at Woodsetts. Mr Wilkinson said careful consideration had been taken to ensure the monks' visit would not be in breach of that injunction. Hydraulic fracturing or fracking is a technique designed to recover gas and oil from shale rock. Before any shale operation can begin in the UK, operators must pass rigorous health and safety, environmental and planning permission processes, according to the Department for Business, Energy and Industrial Strategy.